There are a handful of Playtech slots that really grab me. One is the visually superb Gladiator Slot but in terms of gameplay, the Great Blue slot is my absolute favourite. The beauty of Great Blue is 2-fold: firstly you can get some decent wins in normal play because it has stacked wilds on every reel. Secondly, you can get up to 23 spins with a 10x multiplier in the free spins bonus which, with stacked wilds, can be totally awesome. Great Blue is a very high variance slot however so it pays to take care and not bet too big. It can go on very long cold streaks - I have frequently gone 500 spins without the bonus - but when Great Blue pays it PAYS! I've had wins of at least 500x from the free spins bonus on several occasions and although you have to wait, when you get a 10x multiplier and some stacked wilds landing, the Great Blue slot is one of the best online slots you'll find among the free slots here at OCV - in fact one of the best anywhere! 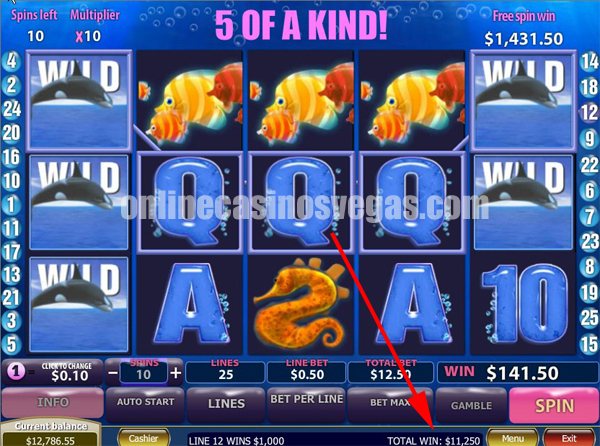 If you want to see a video of the game (including the free spins feature in action) before you play, check out the Slotjunkies Great Blue Slot page. Please note that not every Playtech casino has the Flash version of Great Blue and some that do limit your bet to $2.50 a spin. However the online casinos in the grid above all have it in the download version of their casino and more often than not allow bets of up to $12.50 a spin. When you download a Playtech casino, if you like the Great Blue slot, check out Penguin Vacation and Irish Luck slots too - these have an identical free spins bonus to the Great Blue slot. Apart from the theme (obviously), the only real difference is the number of paylines. Great Blue has 25, Penguin Vacation has 20 and Irish Luck has 30. Great Blue is the highest variance of the three though. Below are the max bet sizes (refreshed May, 2015) for playing Great Blue for real at the top casinos that have the game. This usually applies to both the download and Flash version of the game where applicable. Obviously they might change but I'll check back every now and again. Note that although currencies below are in US$, theGBP and Euro equivalents are in place. $12,500 HIT ON GREAT BLUE!! So I was playing Great Blue one day (I mostly used to play it at Omni Casino - more info on AZOC's safe online casinos list) when I got a bit of a shock! I started with $200 and hit some decent free spins on the Fantastic 4 slot before going into freefall. So I just thought "to hell with it - you win some, you lose some" and upped my bet to $12.50 to finish off. I was about $150 away from going bust when I hit the free spins. The clams opened up for the best possible combo - 15 extra spins and an 8x multiplier giving me a total of 23 spins at 10x. It was already going well - I was on $1,431 when on the 13th spin this beauty below landed for $11,250!!!! I grabbed the screenie mid-countup but you can see the full amount of this hit right at the bottom of the screen. And yes, this is real money play in case you were wondering! It doesn't happen often - that's easily my biggest ever hit on Great Blue slots: previously it was about $6,000 in the free spins. But when it lands like that seriously, I was shaking. I tried to take a better screenshot with the full count-up showing but was so excited I ended up closing the game LOL. Had to re-open it and start from where I left off. Just a quick reminder though that Great Blue is a very volatile slot. You can go a long time without the free spins and sometimes even when you get them you only get 20x or so back. But hit a big one and it's big! If you decide to play for real, just go easy and give it some respect.